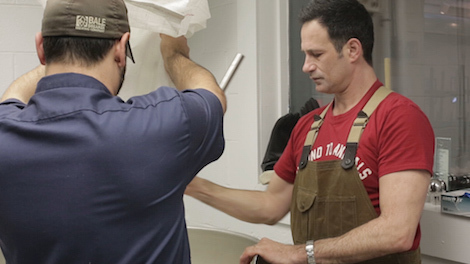 Hollywood meets hops as Dogfish Head's Sam Calagione unleashes his crazy experiment on his famous buddies. We’ve seen our beer hero Sam Calagione pour his guests some crazy brews so far on “That’s Odd, Let’s Drink It”—from a food waste-infused ale for Mario Batali, to a BBQ stout for Chris Bosh. But there were only two people he could use as guinea pigs for one of his most insane experiments yet: college roommates-turned-Hollywoods stars Ken Marino and Joe Lo Truglio. The beer, dubbed “Hoo Lawd,” has been verified by outside labs as the hoppiest beer in the world—more than 10 times hoppier than the average IPA. In order to make it, Sam and his team of lupulin freaks at Dogfish Head used experimental “Alpha King” hops from Yakima Chief Hopunion, as well as super-charged extracts made with Simcoe, Warrior and Amarillo hops. The results are “DEFCON-five-hoppy,” according to Sam. Before punishing their palates with the 658-IBU monster of a beer, Sam calibrates Ken and Joe’s tolerance for bitterness with a tasting of the three hoppiest brews Dogfish Head has in production: 60, 90, and 120 Minutes IPAs. Prior appearing in comedies like Wet Hot American Summer, Eastbound & Down, and Brooklyn Nine-Nine, Ken and Joe lived with Sam in NYC. Along with Ricki Lake, they were there to taste his first homebrew—a pale ale with cherries—more than two decades ago, so it was only fitting to call them back to sample this mad-scientist experiment from a seasoned pro at the peak of his powers. Whether they liked it is another story though. Watch the video above to see Ken and Joe’s reaction to the most intensely bitter IPA ever produced.